A first time writer and director, low budget, and a seeming Asian Lesbian hook, this film seemed like just another gimmick artsy film to play before five people in one of the dirty theaters in town before it gets replaced by a film about Mexican Day Laborers in 1950’s Quebec who are also drug running escorts called Inherit My Skin. Yet it was better than I guessed it could be, or even deserved to be based on the low amount of buzz it’s seeming to get on the indie set. An entertaining drama about life in the Asian American community as reality, freedom, and secrets meet traditional notions of life, family, honor, and saving face. It’s a lot better than that line I just typed, trust me. After a tough day of neurosurgerying, Wil heads home to fine her mother Ma waiting at the steps of her apartment. She appears distraught, but will not divulge why she is there, apparently to move in for a while. Wil talks to her grandmother on the phone, and eventually discovers Ma is pregnant. Since Ma is not married (widowed when Wil was a young girl) and will not reveal who the father is, her father kicked her out of the house for bringing shame upon him. Ma quickly starts turning the apartment into more of an Asian flair, putting up red everywhere, and turning the TV into a 24 hour a day Chinese soap opera marathon. As if Wil doesn’t have enough on her mind, in between surgeries she’s getting hit on by Vivian, who runs into her at the snack machine, and then leaves tickets for her dance show on said snack machine for Wil. Vivian is a dancer, trained in classical ballet, but is currently on leave doing a modern style show. She’s also being considered for a position on the Paris Opera Company, and is the daughter of the Chief of Neurosurgery at Wil’s hospital, aka her boss. As Vivian’s parents are divorced, she doesn’t have close ties with her father, but can use him as an excuse to drop by to seek out Wil. 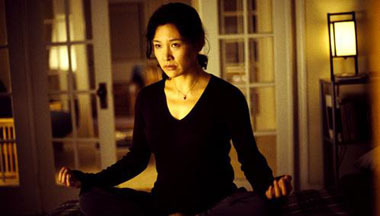 To try to keep her mother from being depressed, Wil sets her up on some dates with a group of random Chinese men her age, all of who are completely flawed in many respects. It’s a neat montage sequence. Wil is still conservative about letting her mom know she’s gay, keeping the relationship with Vivian hidden. It’s revealed later her mother walked in on her and a former girlfriend once, but they never talked about it, so it’s not like her mother doesn’t know. Vivian gets invited over for a meal with Wil and her mom as make up for Wil being so busy at work. Ma is probing with some of her questions, obviously suspecting what Vivian really is. As we jump into subplot city, Wil’s grandmother Wai Gung (Ma’s mother) is hospitalized, and the information is kept from Ma at first because of the extra stress that would produce. Ma is set up with a family friend of the Pang’s who wants to marry her, even though she doesn’t love him. He helps out now that Grandma is in the hospital, and Grandma dies shortly later. Between her grandmother dying and extra work, things aren’t going well for Wil with her relationship with Vivian. Vivian is also offered a position on the Paris Ballet, and is only dragging her heels because of Wil. Vivan’s father is none too happy over this, and tries to give Wil a dressing down. Eventually Vivian gets tired of Wil’s refusal to be open about their relationship with her family and they split up. Wil finally tells her mother straight out she’s a lesbian, and her mother is very upset. Ma is getting married to the man she was set up with, and Wil discovers who the father of the baby is, the old guy Old Yu who’s son keeps giving her herbs at the train station. She rushes down to the wedding, as she was not invited due to admitting her sexuality. Wil stops the proceedings and exposes Old Yu as the father and who Ma loves. This comes as a shock to Old Yu, who is not the father, it is his son, Little Yu, (the herb delivery guy) who is Wil’s age. 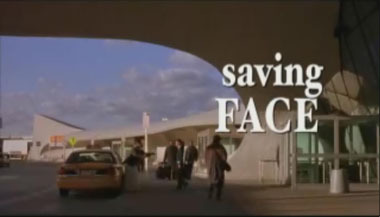 Grandfather is upset that this is making him look bad, and gets yelled at for his outdated concept of “saving face.” Ma and Wil run out of the wedding together and get on a bus, much like in The Graduate. At this point, Ma has realizes what her daughter has done for her, and asks about Vivian. Vivian is flying off to Paris that day, and they head to the Airport so Wil can try to stop her. Wil reaches her before she goes off, but hesitates to kiss her in front of other people. Vivian has had enough, and leaves for Paris. Wil goes back outside where Ma is, heartbroken. Ma has moved out into her own apartment for the first time in her life, and is enjoying it. She’s now open with her relationship with Little Yu. 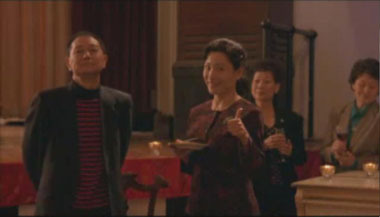 Wil is still traveling through medical school, and is dragged once again to the Chinese Dance get-together from the beginning of the movie. Vivian is also there, though she arrived only because her mother told her Wil would NOT be there. It turns out the Moms did some behind the scenes wrangling to get their daughters happy. Wil and Vivian talk, and Wil finally has the courage to be more open. Some of the older couples are upset over Ma’s obvious pregnancy and the dancing lesbians, and start leaving, but no one cares. Love has conquered cultural norms. Much better than it would appear to be. Other nice touches include the film’s jumping back and forth between Mandarin and English which realistically portrays immigrant families, as I know from first hand experience. 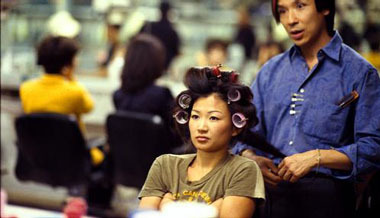 Several scenes involving Wil’s neighbor, who is black, and how Ma at first doesn’t care for him and is closetly racist, to the point where he’s a regular over at their apartment joining in watching Chinese soaps and getting facemasks. As a directorial and writing debut, this film excels far, and I look forward to the sophomore effort from Alice Wu. What seems like a cliched story (women struggle against cultural expectations) is given new life and a more realistic portrayal due to the triumphant characterizations.